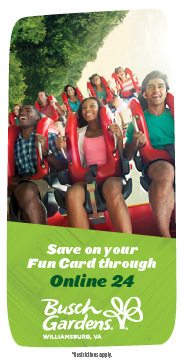 We're excited to partner with SeaWorld Parks & Entertainment, Inc. to offer you member-discounted theme park tickets. Bronco members receive discounts on admission tickets to Kings Dominion and many SeaWorld Parks, and, best of all, there's no waiting in lines - purchase your ticket in the comfort of your home. For those members who don’t know, SeaWorld Parks include the nearby Busch Gardens Williamsburg and Water Country USA. Tickets to to Busch Gardens and Water Country USA, and King's Dominion are available from Online24 at a discounted price. If you're already enrolled in Online24, log in to purchase your tickets. Then click on Busch Gardens in the left menu. If you're not yet enrolled in Online24, go to Online24 and you can quickly enroll, or stop by any Bronco office and we'll get you connected.